This is my last post for LGS. We had our stitching day on the Sunday. It was a wonderful day with our goody bags holding lots of wonderful treasures including lollies to give us extra energy and tickets for extra prizes drawn throughout the day. Also all the gorgeous patterns with starter kits from each of the designers and guest designers were inside. Jenny's Welcome Home Hanging, Vikki Columbine's PDF Folder, Joy's Doodle Blocks , Dawn's Preston Bag, Fee's Everyday Retreat Bag, Marilyn's Shopping Compendium. Marilyn's kit with fabric & trimmings & one with just trimmings. I was a bit late getting up to the table where the kits were and so only managed to buy the above. Here is our table with our surprise guest designer Rosalie Quinlan paying us a visit, Dawn Hay, Teresa, Narelle, Michelle, De, me and Deb. I have lots of Rosalie's patterns so it was wonderful to meet her in person. This is Rosalie's project for us. She kindly ironed on the stitchery for most of us and signed the bottom with my name and hers. I will definitely treasure this. The charm pack on the right was the one I received in my goody bag. To finish, this is the back of my mug rug which has been signed by all who attended. The day was the highlight of the weekend. We had wonderful food, great company and managed to get some stitchery done as well. Thank you to Vicki, Dawn, Fee and Joy for making the weekend such a success. 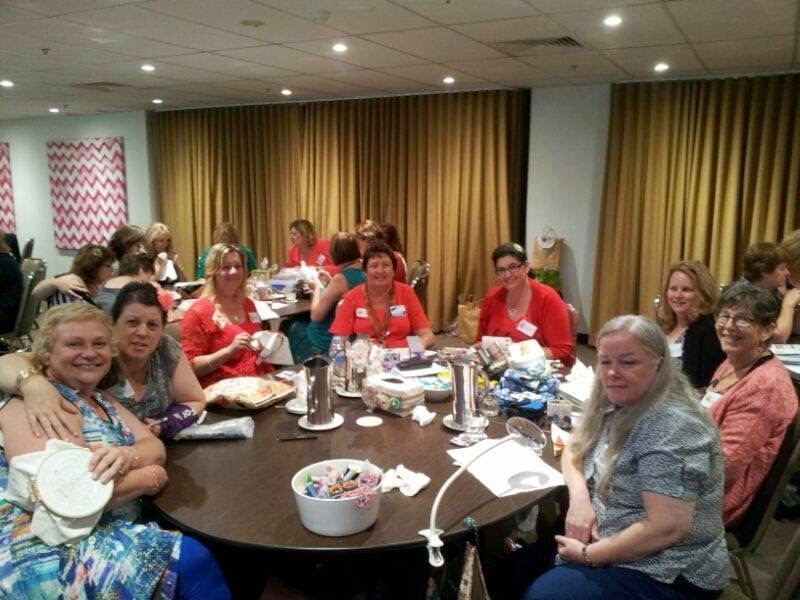 In March 2015, Let's Get Stitched will be in my home state of Queensland. All of those goodies look wonderful. It must have been a real thrill meeting a designer you admire so much! It really sounds like it was fun event and so nice to meet some designers you admire . Looks like a fantastic event. So many special touches like the stitchery and the signed mug rug. Lots of lovely new projects too. I had to weigh something when I got home, so I weighed my goody bag too. It was 1.7kg! No wonder my suitcase was so heavy lol.